This month a special review of the life of Mr. and Mrs. Santa Claus. After the packages are loaded and the reindeer are all hooked up, it's take off time. Santa carefully checks his list and determines which good child he will be visiting first. Surprise, surprise, it's his nephew Jameson Claus. Arriving at the house, he eschews the legendary rooftop landing in favor of the driveway. After all, he is family. Here he will spend a good couple hours laughing over times past with his sister Joanie and his brother-in-law Pete. Pete is a barber and Santa never misses a chance to zing him about his receding hairline. After a few good belts of port, Santa is 'jolly' and 'red nosed,' ready for the long trip. At first things go smoothly. He likes to get America out of the way first as it's the busiest. Each house he stops by is left with a gift they'll never forget; a large red faced old man with prostate issues, breaking into their house. Here is where Mr. Claus is at his finest. When he was but a child, he was employed in the family business as a chimney sweep. 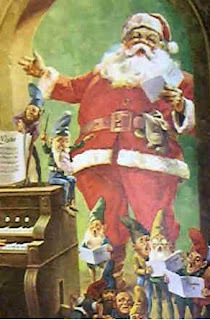 During this period Santa learned all the ins and outs of chimneys. He demonstrates this knowledge with the deftness and agile qualities only the best of cat burglars can claim. Like that he moves through the houses, every couple hours showering some lucky family's bathroom with 'Christmas cheer.' Eventually he has covered all of North and South America. Choosing carefully he decides on visiting Europe next. First is England, which he called home for a good part of his life. To the little town of Painswick he makes he travels. Here as long back as anyone can remember, he hasn't been known as Santa but by the more more traditional title of 'that SOB what chopped down our yew tree.' Santa does not leave any presents here, but merely does some flybys of certain houses. Allowing all the residents to take joy in the sleigh bells. After Europe, he moves on to Asia. All across the land he delivers toys to boys and girls. In some places he even gives special presents to farm animals who have been particularly good. By the time he is finished with Asia, Santa is starting to get worn down. Tired and at the same time wired from all the sugar he has consumed, a decision must be made. Once again he will not be able to visit every child on his list. Some must be cut from his list in order to make the deadline. With a heavy heart Santa turns his sleigh towards Australia, once again giving the shaft to Africa. This is as much of a tradition as anything else. On the way he dumps the excess toys out over the ocean so that he can avoid the glares of he elves and a lecture from Mrs. Claus that he would surely get. Australia is a lovely place, and he finishes up quickly. Afterwards he stops at a nice restaurant to treat himself to a healthy portion of kangaroo steak. Work done it's back to the North Pole. Here his wife greets him with a kiss on the cheek. More than she's given him all year. Mr. and Mrs. Claus haven't been getting along that great the past few years. Mostly they stay together for the elves sake. A quick check over things to see if he's forgotten anything and then it's back inside. After a long day, Santa takes off his sweat drenched red suit, hands it off to an elf for dry cleaning, and falls into bed. Here he'll sleep for the next 48 hours in what can only be assumed is a diabetic coma of sorts. Then for the rest of the year it's back to living the semi-retired life. NEXT: The story of how Santa and the Mrs. wound up together. "See, fat man can't be bothered to move any packages himself. And if you were to ask him about it, he would mumble something about a 'bad back.'" I knew it, I knew it! Next thing you'll hear, that lazy bastich will be collecting disability checks and that's where his real income comes from! Plus with as many aliases as he has, you know he collects under each name.